This post is about my experience localizing a successful education app so that you see that a lot of marketing is still needed, and if you don’t do it you have all the chances that your localized app will be not visible (like my Spanish version). For the notice, the English version of Word Wizard app has been mentioned in the NYT and Wired's GeekDad, awarded by Children's Technology Review, selected by Apple as "New and Noteworthy" app for iPhone and iPad in the US. The french version has been App of the week on iPhone on the french App Store. As of today, 41000 units of Word Wizard have been sold and 12100 units of the french version. So I decided to localize in Spanish and did it carefully. Since it is an app to learn to write/read/spell, it is a lot of work to be localized. I hired a translator, a voice talent to record Spanish phonics, built hundreds of words list for quizzes, updated graphics, did test the app with native Spanish, included Latino and Castillian voices, made a nice icon, etc... . It took me at least 3/4 weeks of hard work and I released it at the beginning of December. I made a nice YouTube demo and I wrote to at least 30 Spanish blogs and web sites that focus on iOS and Apple, telling them how innovative it was and how it was recognized in France and in the US (of course with a link to the video). I also released a PR on PRMac. I was optimistic when it was featured as “New and Noteworthy” on the iPad Mexican App Store the week the app was released (at this moment the app begins to sell pretty well in Mexico). Yes I sold only 4 units yesterday. So I think we can call it a failure compared to the US and French version (you can check the result of the US and french version in my previous post). Why ? I don’t do enough marketing. Nobody is talking about the Spanish Word Wizard/ La Magia de la Palabras. On all the blogs I contacted, only a kids focused site (appmama.es - thanks Sonia) did a very nice review, and small site did a small article about it as well. Another difficulty is that I’m not fluent in Spanish and I wrote to bloggers in English - I think it was an error. Also the app has not been featured in the Spanish App Store (which also the one that is used in South America) - it is perhaps a little bit pretentious to think that you’re gonna be selected, but when the same app has been featured in all others countries you may hope/think that it will be selected when you localize it correctly. Now let's compare with the french market, it is a really different experience. I'm french and I've already released a successful french educational app in 2010, and have already some good contact with bloggers. The day I released the french version of Word Wizard, I sent only a few mail to selected bloggers, and I was mentioned in two important iOS blogs and then relayed by several small blogs. The week after, a second very big iOS blog did a post about the app. Then Apple selected the app as "New and Noteworthy" on iPad and iPhone, and then 3 weeks after, it was "App of the Week" on iPhone... A really different experience, isn't it ? By the way, I just released a German Version of the word wizard but I did not start marketing yet (and thus almost no sales...update! German version has just been featured on the German App Store). I worked also pretty hard on this version and will do better marketing (and also because the market is larger). I'm also setting up a way to do faster localization for others languages (Finnish,Swedish,...) because I can't afford to spend 3 weeks for each localization. A good final question would be : does it worth it ? It's clear that the french version sales are good enough so that it worth it, but I'm not sure it will be profitable for others versions because I'm not going to do a lot of marketing for these languages and due to the market size. It would be more profitable to create a new app for the English market but, actually, I sell enough units in English and French to do what I want, and I love localizing the app (yes I really believe my apps is fabulous and parents and teachers in all country really needs it ! ). 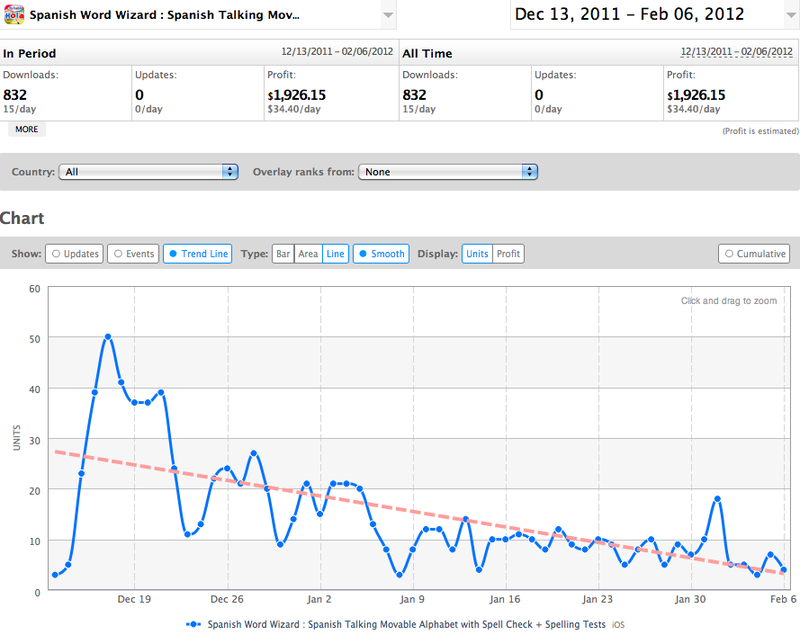 How do your app's search keywords compare between the English/French and Spanish versions? Do you get a sense that a lot of your sales are driven by app store searches?